Movembers a lot of fun for most of us. 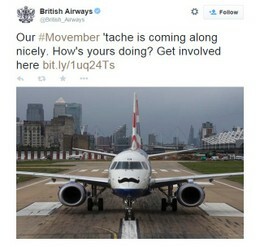 This week we analyse what you can learn from Movember to make you’re social media more effective. 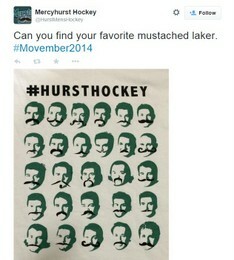 A quick look at social media will tell you we’re staring down the face of Movember (already!) and the question of whether to ‘tache or not to ‘tache raises its head. Yes, that’s right, it’s nearly Movember and men (and women) the world over are considering ways that they can support this very worthwhile charity. As a full service digital agency we want to look deeper, analysing why initiatives like November are so good at engaging large audiences and how you can apply the same thinking to your campaigns. Every year, in November, Movember turns moustaches into a symbol of support for its cause. But what was once a very simple premise with an equally simple fundraising journey has become somewhat of a behemoth. Ask most people what they think Movember means and what the movement supports and they’ll say, “growing a moustache in November, get some sponsorship and raise money for testicular cancer”. But Movember has become so, so much more than that. Let’s explore. The story of how Movember began is quite well known now. Like any good tale, it started when two men walked into a bar. In 2003, two Australian friends were catching up over a beer in Melbourne and, as an inside joke, came up with the idea of getting all of their mates to take a nostalgic trip back to the 70s by growing devilishly suave moustaches. But the following year, they turned their joke into what has become a hugely impressive fundraising and awareness campaign for prostate cancer. In their first campaign, the group of 30 friends rustled up £21,184, and in the next year £527,492. Now, the total amount of money raised stands at over £400 million with 5 million men and women (or Mo Bros and Mo Sistas as they like to call them now) from 21 countries around the world regularly getting involved. Since its inception, Movember has become one of the biggest forces for awareness and fundraising around a range of men’s health issues, from testicular and prostate cancer, to men’s mental health, and supports over 800 men’s health projects internationally. So how was an idea thought up during some idyll bar banter transformed into the biggest non-government fundraiser for men’s health issues in the world? It started with a clever, funny and very social marketing strategy, that’s how. In fact, they’ve created an entire brand experience that is built around shareable content. By sending out daily moustachioed selfies, Movember practically takes over social media streams across the month. Just by searching #movember on Instagram alone you’re met with well over 1.4 million hirsute images. And last year over 1.5 million tweets were published that mentioned Movember. Every year, this social trend is bolstered in the lead up to – and during – November when the charity rolls out a brand new campaign aimed to educate, entertain and challenge the masses. Looking back at early examples, like ‘Are You Man Enough to be My Man’, it’s clear humour has been at the heart of their delivery. And still is. Recent years have seen the straight forward, highly social movement, grow far beyond its relatively humble roots. 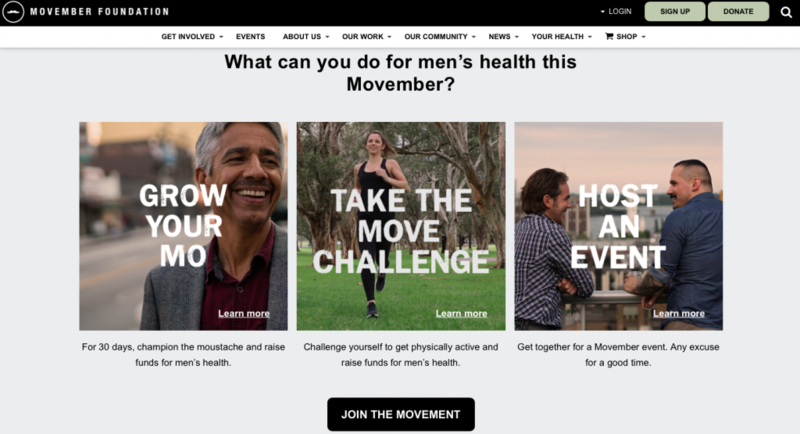 The Movember Foundation not only supports a number of charities, but also engages its audience through an eye-watering number of channels, different tactical campaigns, events, media, awards, vast amounts of printed material and merchandise, a live chat function and community-based content. It’s even got specific activities that businesses can get involved in, attracting some of the biggest brands in the world including British Airways, Gillette, Premier League football teams and the NHS. Social media is awash with product tie-ins and co-promotion. It’s exhausting! Online, Movember has created a community hub, which is bursting with attention-grabbing, social media friendly, highly shareable content. It allows people to interact with the brand, and much of the content is user-generated, furthering the community aspect. Take a look at the website and their social media channels and you’ll instantly be hit with a plethora of content, ranging from short videos (such as Moustaches Make Food Taste Better, which explores the benefits of having a ‘flavour savour’); competitions (for example a short film contest with prizes being awarded at The Moscars in December); interviews with people considered to be a ‘Mo Bro Hero’; and styling/grooming tips. There’s also an app available, an online radio station and a range of events being held across the month to celebrate the Mo Community. No matter your thoughts or opinions on the cause itself, you’ve got to be impressed by it all. Movember is an entire brand experience. And it’s engaging, entertaining, inspiring and utterly shareable. They understand the importance of great content, what they need to do to appeal to their audience and interact with them on an ongoing basis outside of the Movember month and facial hair, and this combination has helped them build one of the most impressive, modern and relevant international charitable campaigns ever seen. Even if you’re not taking part this year, it’s a great example of how effective community content hubs can be – a strategy DVO is very passionate about. The question is, when you wade through the sea of facial hair on social media, has their marketing strategy worked for you? If you’re looking to create a community hub of your own, get in touch here. Looking to build your content marketing and social media marketing and engage with your customers on a deeper level? Give us a ring on 020 3771 2461.